This is by no means a scholarly article, although all the figures are from documents made public by the National Statistics Office through its web site at www.census.gov.ph. This article compares Filipinos to Filipinas in the areas of life expectancy; literacy and education; and employment. While some general conclusions may be arrived at by looking at some of the data, some also invite further investigation. For instance, in education, available data was up to the completion of the secondary level only. 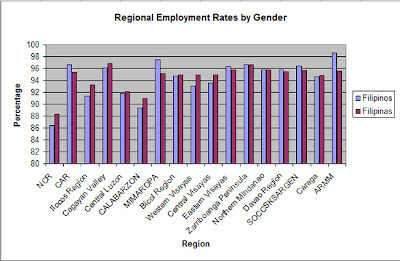 The regional employment rates may also raise eyebrows. That said, the employment rates do not specify actual incomes. 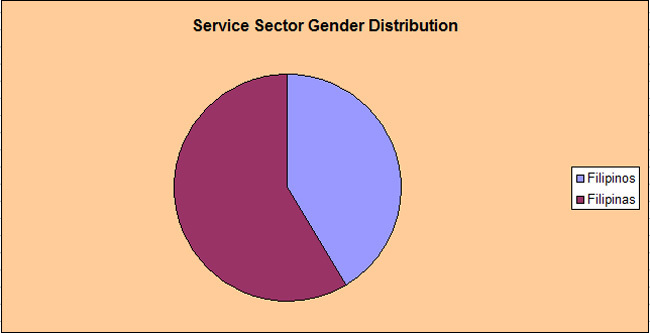 For those whose curiosity may be stimulated by these posts, please visit the NSO web site for their interesting gender fact sheets. Filipinas born between 2005 and 2010 are expected to outlive Filipinos by 5.53 years. This estimate was based on data obtained and projections made from the 2000 national census. Filipinas born between those years have a life expectancy of 71.64 years; while their male counterparts can only expect to live 66.11 years. 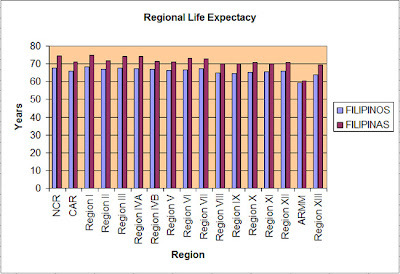 Region I, the NCR and Region III are the top three places to be for Filipinos who wish to live longer. As per 2000 census data, Region I has a life expectancy of 74.72 years for Filipinas and 68.37 for Filipinos. 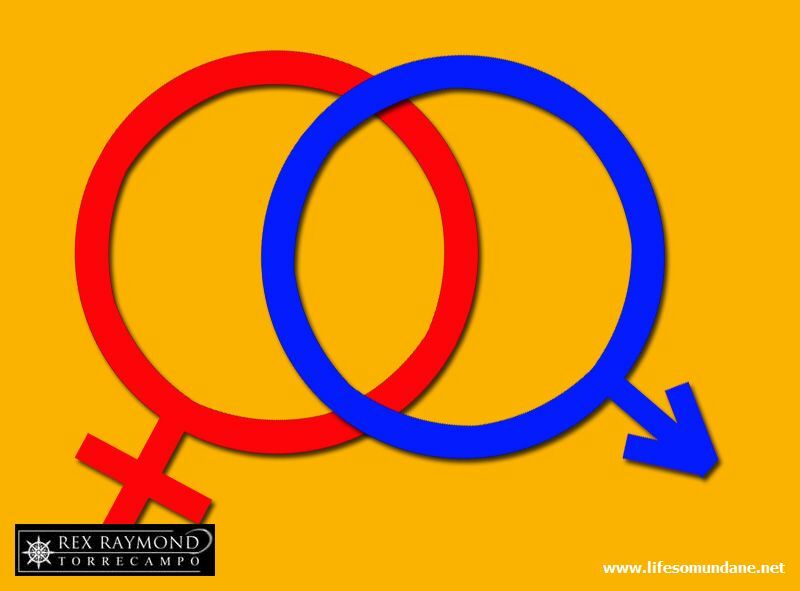 For the NCR, the life expectancy figures are 74.35 and 67.61 for females and males, respectively. 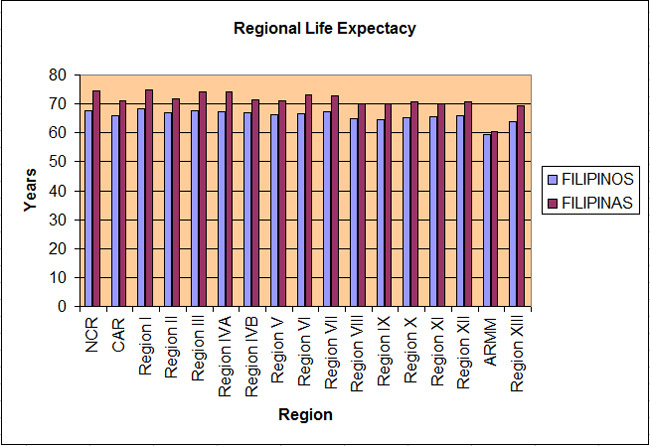 Finally, in Region III, the life expectancy for Filipinas is 74.21 years; while for Filipinos it is 67.52. A Functional Literacy, Education and Mass Media Survey was undertaken in 2008. 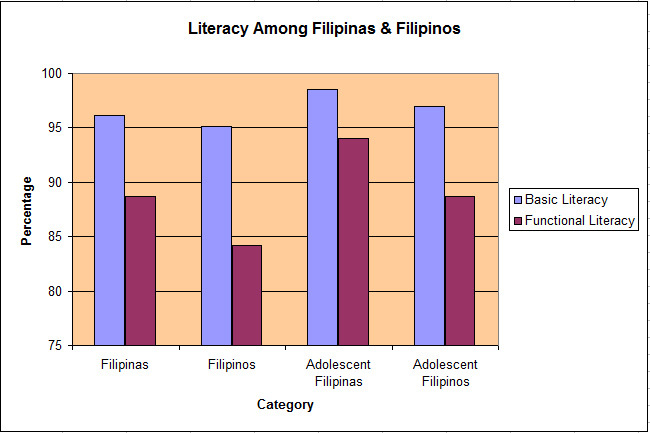 From this survey, it was determined that 95.6% of all Filipinos 10 years old and above were basically literate. Basic literacy, in the context of the survey, pertained to the ability of the individual to read and understand a message in a language or dialect. The survey discovered that 96.1% of Filipinas were at least basically literate, 1% higher than Filipinos, of whom 95.1% were found to have at least basically literacy. Functional literacy was also higher for Filipinas than Filipinos, functional literacy being the individual’s ability to read, write, compute and comprehend. The survey showed Filipinas to have 88.7% functional literacy, compared to only 84.2% among Filipinos. Furthermore, more young Filipinas between the ages of 15 and 24 were found to be at least basically and functionally literate than their Filipino counterparts. Young Filipinas were found to be 98.5% and 94% basically and functionally literate, respectively; compared to the 97% and 88.7% figures for Filipinos. Finally, the figures were also higher for Filipinas over Filipinos in terms of formal education. Among all Filipinas six years old and above, 70% were able to complete elementary education. 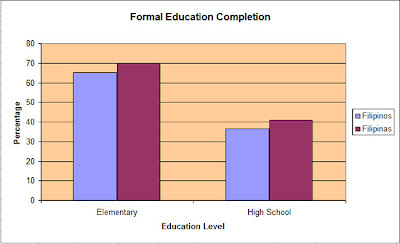 In contrast, Filipinos only had a 65.1% elementary education completion rate. Filipinas also had a 41.1% completion rate for high school education compared to 36.4% for Filipinos. According to a Labour Force Survey undertaken in 2008, of the country’s 34.5 million employed persons at the time, 93.5% were Filipinas compared to 93% Filipinos. 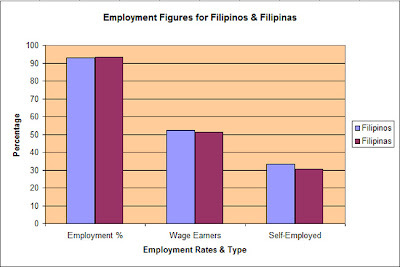 More Filipinos, however, were wage and salary workers compared to Filipinas, the figures being 52.4% and 51.2%, respectively. There were also more Filipinos who were self-employed or proprietors of their own businesses compared to Filipinas, with figures of 33.3% and 30.6%, respectively. In regional terms, the highest employment rates for Filipinos are the ARMM with 98.6%; MIMAROPA with 97.5%; the CAR and the Zamboanga Peninsula, both with 96.6%; SOCCSKSARGEN with 96.4%; and Eastern Visayas with 96.3%. For Filipinas, the highest employment rates are in the Cagayan Valley with 96.8%; the Zamboanga Peninsula with 96.6%; Eastern Visayas and Northern Mindanao, both with 95.8%; and SOCCSKSARGEN with 95.7%. In the agricultural sector, Filipinos outnumbered Filipinas as managers of farms according to the 2002 Census on Agriculture and Fisheries. There were a total of 4.8 million agricultural operators in all, the term referring to individuals who were responsible for the management of a farm holding. Of the total, 89% were Filipinos while only 11% were Filipinas. In the service sector, on the other hand, Filipinas outnumbered Filipinos according to the 2005 Annual Survey of Business and Industry. 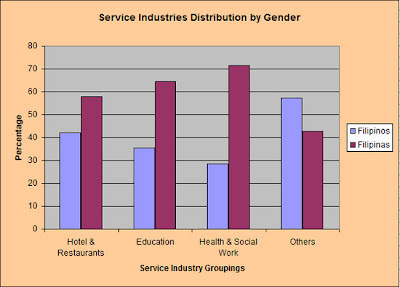 These service industries were grouped as Hotels and Restaurants; Education; Health and Social Work; and Other Community, Social and Personal Service Activities. Of the 1.17 million total workers in the service sector, 684,317 or 59% were Filipinas; with only 482,295 or 41% being Filipinos. 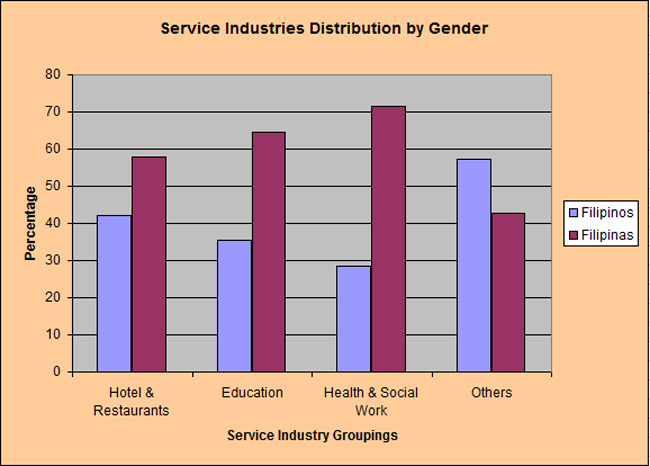 Filipinas also outnumbered Filipinos in three of four service sector industry groupings. In hotels and restaurants, there were 316,802 compared to 231,345 Filipinos. In education, 179,275 were Filipinas compared to 98,175 Filipinos. Among Health and Social Action workers, 106,074 were Filipinas compared to only 42,415 Filipinos. In all other service activities grouped together, there were 110,360 Filipinos compared to 82,166 Filipinas. 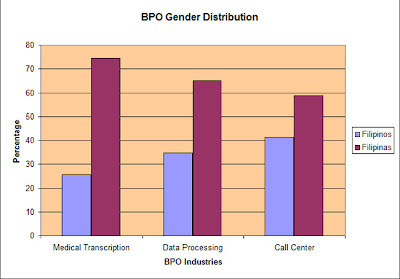 In Business Process Outsourcing industries, Filipinas outnumbered Filipinos of the 81,578 working in the medical transcription, data processing and call center industries in 2005. The ratio was 55.4% to 44.6%. In medical transcription, 74.5% were Filipinas compared to only 25.5 Filipinos. Filipinas also dominated the data processing industry, with 65.2% compared to 34.8% of Filipinos. Finally, in the call centres, 58.8% were Filipinas compared to 41.2% Filipinos. 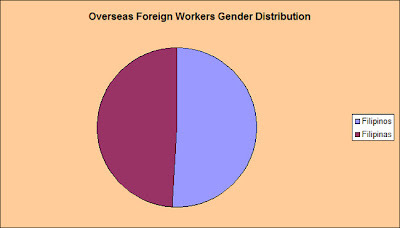 There were slightly more Filipinos, meanwhile, among the 1.75 OFWs in a survey undertaken in 2007. Of the total, 51% were Filipinos while 49% were Filipinas. On the average, however, the money sent home by Filipinas was only roughly half of what Filipinos sent home. Just to end on a lighter note, in a nationwide study of birth certificates conducted in 2005, the names Joshua and Angel were found to be the most common given to newborn Filipinos and Filipinas, respectively. 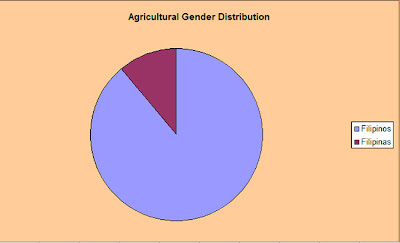 Below is Top 10 for each gender.